RBTH presents a selection of views from leading Russian media on international events, featuring reports on the results of the latest European Council meeting on Ukraine and the visit of German Foreign Minister Frank-Walter Steinmeier to Moscow, as well as upcoming negotiations in Kiev on defense and economics with U.S. and EU participation. The Kommersant daily reports that the main result of the latest European Council meeting was the decision to add another ten representatives of the unrecognized Donetsk and Lugansk people’s republics of eastern Ukraine to the sanctions list by the end of November. This was the European Union’s reaction to what the West views as the “illegal” elections held on Nov. 2 in the Donbass, as well as an alleged expansion in the militants’ military capacity with support from Russia, Kommersant writes. However, despite urgings by Moscow’s most vocal critics, Europe’s key diplomats did not insist on tougher economic sanctions against Russia, Kommersant reports. According to Kommersant’s source in EU structures, there may be talk of tightening the sanctions against Russia at the EU summit in December if “the separatists supported by Moscow” cross a “red line” by spreading hostilities beyond the Donetsk and Lugansk people’s republics. Meanwhile, the EU has started looking for ways to reduce the tension surrounding Ukraine and to change the negative trend unfolding in its relations with Moscow, Kommersant writes. German Foreign Minister Frank-Walter Steinmeier has suggested a new approach – arranging a meeting between representatives of the EU and the Eurasian Economic Union. This, in the politician’s view, could serve as “the first contribution to easing relations.” A source in Russian diplomatic circles told Kommersant that “the idea of establishing direct contact between two unions is a very sensible initiative." “Berlin wants to reconcile Russia and the EU,” reads the headline of an article by Nezavisimaya Gazeta, which reports on German Foreign Minister Frank-Walter Steinmeier’s visit to Moscow on Nov.18. According to the newspaper, Steinmeier intends not only to discuss the Ukrainian crisis with his Russian counterpart Sergei Lavrov, but also to make another attempt at improving relations between Russia and the EU by bringing representatives of the Eurasian Economic Union and the EU to the negotiating table. Kazakh President Nursultan Nazarbayev has already endorsed Steinmeier’s initiative. But given the confrontational policy of the United States and several EU countries towards Russia, it will be no easy task for the initiative to meet with general approval, the newspaper writes. 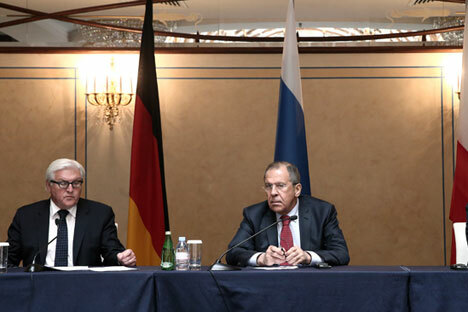 The situation is further complicated by the fact that Washington, London, and Warsaw regard Germany’s position of maintaining direct contact with the Kremlin with mistrust. Another article by Nezavisimaya Gazeta reports that U.S. Vice President Joe Biden and new European Commission President Jean-Claude Juncker are scheduled to visit Kiev in the near future. It is assumed that the negotiations will center on two topics: defense and economics. According to the newspaper, Kiev is asking the West for aid, citing the threat of a large-scale war, while EU and U.S. leaders keep reminding Kiev that the Euromaidan movement’s demands have yet to be met and fundamental reforms yet to be undertaken. This is causing latent discontent both within Ukraine and in the West, Nezavisimaya Gazeta writes. Director of the Agency for Situation Modeling Vitaly Bala told the newspaper that the West can’t pull the plug on the Ukrainian crisis. “A turning point has been reached: Either reforms and support from the West, or attempts to play for time and preserve the old schemes and system of management, but without Western financial support,” said Bala. Ukraine is holding out serious hopes for Western military and technical aid, Nezavisimaya Gazeta writes. The Ukrainian leadership claims on a daily basis that it has no intention of initiating hostilities to forcefully secure control over the Donbass territories. Meanwhile, the leaders of the breakaway republics are again proposing to sit down at the negotiating table in Minsk. According to Nezavisimaya Gazeta, Kiev is unsatisfied with the Minsk negotiating format at the Ukraine-OSCE-Russia level, plus representatives of the two breakaway republics. Kiev insists resuming talks within the ‘Geneva Four’ format – Ukraine, Russia, the EU, and the U.S. The Russian Foreign Ministry has already said Russia sees no point in that format because the agreements reached at Geneva in April never came to fruition.